This past week saw the last official business of the 2015 council and next week Tuesday the 2016 council will conduct its first work session. Last week's Special Council meeting was much more chaotic than I expected or desired. I expect there to be more chaos than desired Tuesday just because there will be a lot of changes not only do we have three new council members but we also will be going to the work session format. How do we efficiently conduct committee meetings? As we usher in the new year, this Tuesday council will meet as a Committee of the Whole. Initially, these meetings are scheduled twice a month and start at 6 pm. This single meeting is currently the only one on the schedule and we hope for it to do the work that was previously done by three committees; the Safety Services Committee, the Public Works Committee and the Administration Committee. In previous years the Safety Services Committee would typically meet once a month for 30 to 90 minutes, the Public Works Committee would meet twice a month for 60 to 90 minutes each session and the Administration Committee would meet twice a month typically for 60 to 120 minutes. The current start time of work sessions is 6 pm so the back of the napkin calculation tells me that we could often see meetings going until 11 pm. High interest items may take the meeting even later. The one difference that really has the potential of creating long meetings is that the content of the administration meetings used to be very well defined prior to the meeting starting. In the past you've actually heard me complain about the information in the administration committee because it only seemed to present the positive aspects of a proposal without talking through some of the negative aspects. One of the positive things that happens when meetings are run this way is that the committee can get through all the agenda items within two hours. The problem is that when two or three people are getting together to decide important items, no matter how smart those two or three people are, sometimes important avenues that need to be explored get missed. The previous administration committee chairman would often sit down prior to the meeting with the City Manager and other key personnel and get filled in on the topics of the administration committee. On one hand, this is commendable because it shows organization and preparedness. On the other hand, much of the work done there was suppose to be the work of the committee and it prevented the public from seeing the talk through of alternative choices that probably happened but I believe the public had a right to see. The puzzle going forward with the work sessions will be to figure out how to be organized and prepared for the work sessions while at the same time efficiently showing the public that council actually does consider multiple choices. One of the things that I've advocated for, since well before I was elected mayor, is more timely read ahead information in the meeting notices. Another thing I would like to see is an electronic discussion board that council members and staff can use and the public can monitor. With these two items, Council can come prepared to the work session and the public has the opportunity to see how members got to the position they take during the work session discussion. Extended Council Meetings, Good thing or Bad? Thursday we had a Special Council meeting scheduled for 10:00 am that I expected would be over by 10:30. It wasn't. There were three items that extended the meeting; a discussion about the financial transaction for which we needed to call the special council meeting, a discussion about absences from council meetings prompted by an email I wrote during the week and a discussion prompted by resident and council member interaction. The question is were any of these discussions a useful use of our time. My evaluation is that one definitely was useful, a second deserved some discussion and the third was a distraction. The point I want to convey in this section is that I believe the discussion about the transfer was productive even if it was longer than I expected. I intend to post the link to the video and let you know what times that discussion occurs so you can judge for yourselves. In short, the issue was the City had a loan out for about $11 million dollars that we decided to refinance at lower interest rates. All the appropriate approvals were granted by Council. The original loan had restrictions on when refinancing could occur, because of these restrictions some of the timing for transferring money from one fund ledger to another got off and the original approval by Council that authorized the transfers timed out. This legislation was to re-authorize the transfers. That was the short version of a long discussion. Toward the end of the discussion, Ms. Janell Smith brought up a question that was asked earlier by another resident, "what is the city doing to keep this from happening again?". I know that by this time many were ready for the discussion to end but this was a legitimate question and I'm glad we took the time to address it. I am hoping that after thinking about it after the meeting, staff puts in a better implementation than the one brainstormed at the meeting. So even though there wasn't a great solution presented two things were accomplished; first we know that a failsafe method is not in place and second it brought the fact that there isn't a failsafe method in place to staff's attention. 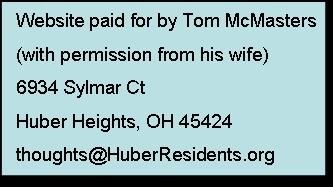 "I will be unable to attend the Month Day, 2015 Huber Heights City Council Meeting as I will be unavailable during that time period. I respectfully ask that the City Council excuse my absence at this meeting. Thank you for your support in this matter. Please feel free to contact me with any questions"
I've never thought this letter was sufficient to be the official reason given to the public. This past week, I sent an email out letting Council know that I was no longer going to recognize this as satisfactory. The discussion that occurred because of the email would have been more appropriate in a committee meeting but it is a discussion that should occur and if it happened in a council meeting that's ok too. It's kind of a shame that the tone of the discussion was such that some other Council members thought I am an evil ogre for not liking the letter that's been used for years. That's always a chance a person takes when they propose something different. It'll be interesting to watch the video of this discussion. From my recollection, Mr. Campbell brought up a legitimate request to clarify the email (even if I do think that most people understand the point I was making) and then the conversation digressed after that. I wonder if my initial reaction to the subject when it came up at the meeting was defensive and that prompted all those comments about my not getting to vote. The other item that took a lot of time was pretty much useless and destructive to running a good meeting. This was the inquisition one of the council members tried to conduct on a resident. Yes, I know the rules of Council are set up saying I should protect council members from accusations from the public and some council members have a different opinion of what constitutes an accusation than I do. So that my position is known, I'm pretty lenient to the public on how they should act. If you do plan to speak to council I will offer this advice, it is often more difficult to hear good advice when it is presented with a lot of anger. To council members, I offer this advice, just because someone is prompted to speak because they are aggravated it doesn't mean that there can't be good advice found within a bad presentation. I believe as public officials we're stuck listening to some inflammatory statements. On the other hand, the inquisition the one council member tried to conduct on the resident (who often speaks in an inflammatory manner) was embarrassing to all of Council. Toward the end of the discussion prompted by the inquisition, it was necessary for one person whose name was brought up to be able to present his view of one of the items discussed. At the end of his statement, he relayed that it was important that he got the last word in so that people knew his statement was the accurate statement. I found this peculiar. The logic of people's statements plays a much greater role in whether a person "wins" the argument than who speaks last. This is a point that I think isn't often understood and it was especially misunderstood by previous councils and often some of my friends. If you go back to before I was elected, you will see that I often spoke about council matters in the public comments portion of council meetings. I would make my statement go back to my seat and then there would be a response from the dais. I and all my friends and neighbors would judge my statements as logical and the response from the dais as foolish, but I would often get feedback that I should have argued more from the floor and that nobody gave any thought to my statement because "they got to speak last". What is worse is that previous councils took the attitude that they had the public's support because they got the last word. We would all be in a much better position right now if those councils had realized that it is the logic of the argument that is important. I'm looking forward to the next couple years now that this council must realize this truth. I tend to agree with your comments. The citizens have spoken in the last election and want a different direction or might I say correcting the course. Your comments about were right on while I cannot say anything for the second I sure can for the third. Yes I say things in a very direct manner, I do not sugar coat anything. One might ask why am I that way. Well for the past 2+years I started to go to the council meetings and speak and when I ask questions and do not get full answers I grow frustrated. The citizens expect better on getting the right correct full data out. The council member that called me out put in a email sent to all and me later to remind me of the definition of integrity. Some key words truthful, completeness, to name a couple. I continued to get half truths as I call it. What is a half truth? Well here is what it is…A person as in the music center says the center made a profit. Well did it. I have requested data for months and get piecemeal. I still do not have the final answers to my questions. That is just one of many that have made me grow frustrated at the way the city and old council were running things. Once the press release or article is written with half truths the story is correct but make the reader think one way instead of the correct way. 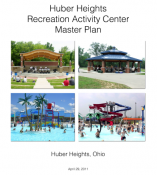 My new years resolution if I want to have one in this area is having a council and city manager that work for the citizens of Huber not their self interests. We want to see the city manager and council work for us. We want full clear accurate information, not to work with emergency actions (I will comment further on that), get our finance in order before another penny is spent so all know the $50M+ debt impacts the residents of the city, no more sole source, no more subsidy for DEC for Carriage Trails (more to follow), explain the disconnect of the special assessment that those residents pay which is much less that what they signed for at closing? Does this mean that the city will be eating the cost which is a result of poor decision making? If DEC wants more subsidies for Phase three and four then they should come with open books and show why they need one. When I asked the question the response I received is we do not look at their books. Well now do you know they need one. The city should not be the one working up the deal. It starts with DEC. If they say they will walk away from it without it then maybe we do not need them to continue. While I am not an attorney Huber Heights in 2015 operated under the everything is an emergency (most of the time). I have been trying to see if I am correct when you do emergency legislation and non emergency. While I cannot say in the affirmative but it looks like emergency cannot be changed so sole sourcing to DEC all the time cannot be changed much less any other contract. Maybe someone with a more legal background could clear that up. I am going to assume that the music center did indeed loose money their first year. I as a citizen would like to see MEMI come make a presentation on why they think we lost money and what can be done to show a profit, and take questions from council and citizens and answer them instead of getting filtered data through the city manager. Hopefully our city will open up more and let the citizens know truthfully what is going on from debt, subsidy's bonds, TIF, risk just to name a few. I wish this next city council all the best especially to the three new members of council and my you stay true to your beliefs in the decisions you will make to make Huber Heights better.